Here is my latest cartoon which shows Elijah on mount Carmel. At the customary time for offering the evening sacrifice, Elijah the prophet walked up to the altar and prayed, “O LORD, God of Abraham, Isaac, and Jacob, prove today that you are God in Israel and that I am your servant. Prove that I have done all this at your command. Immediately the fire of the LORD flashed down from heaven and burned up the young bull, the wood, the stones, and the dust. It even licked up all the water in the ditch! Scene 07 – Heavenly fire – evening. Scene 07 – Heavenly fire – the fire from heaven is the major light source in this cartoon. 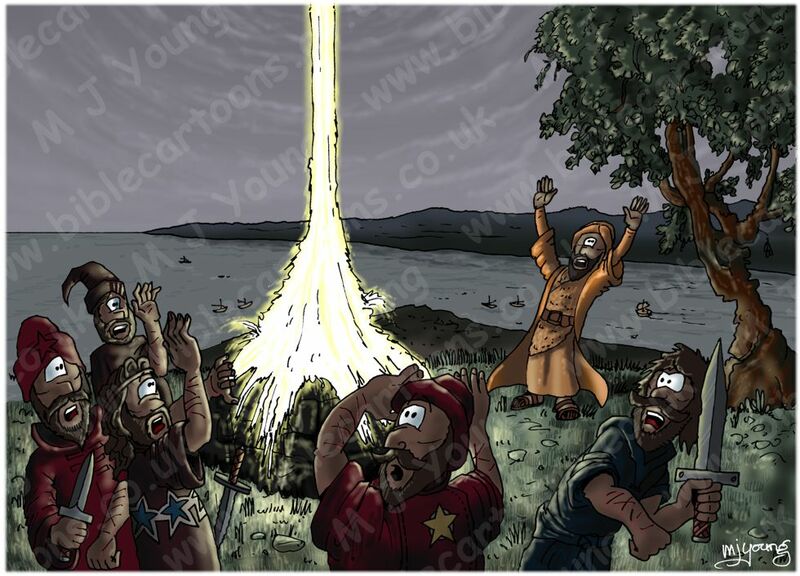 Scene 07 – Heavenly fire – Elijah (in orange) & 5 of the 450 prophets of Baal & 400 prophets of Asherah. Google earth position & orientation – 32°49’34.01“N 34°58’15.81“E looking NNW, over the Haifa Bay. The Mediterranean Sea is off to the left. Mount Merom can be seen on the horizon, between the branches of the oak tree on the right of the cartoon. Them ountain is approximately 28 miles away. Incidentally, the Sea of Galilee is approximately 31.5 miles away, due east, though not visible from this cartoon vantage point. I wanted the fire from heaven to be very bright & pure, so made it white hot, pouring down from heaven like liquid metal, reminiscent of metal from a foundry, being poured out. The symbols on the prophets of Baal/Asherah are stars. Apollo was worshipped by the prophets of Baal here, he being a sun “god.” I decided to use stars to represent the prophets allegiance to the sun or heavenly bodies. 1 Kings 18:28 (NLT) states: “So they [the prophets of Baal] shouted louder, and following their normal custom, they cut themselves with knives and swords until the blood gushed out.” I have drawn the cuts on the arms of the prophets in my cartoon, & represented their blood a little, but didn’t particularly want to depict them with “blood gushing out”! I draw & completed the Transfiguration (from Luke 9) in June 2009. In that series of cartoons I had worked out what Elijah looked like & have used the same clothing & colour scheme for him in this cartoon on mount Carmel.